looking for peace and privacy. The Torreruja Hotel Relax Thalasso & Spa is located in Isola Rossa, a small and picturesque fishermen village in the Gulf of Asinara. 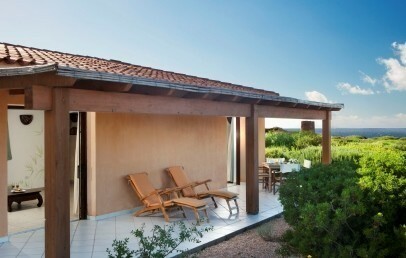 Approximately 1 hour drive from Olbia and Alghero and 40 minutes from Santa Teresa di Gallura and Porto Torres. The hotel has a particular romantic glamour and is perfect for a relaxing holiday in one of the most charming areas of the island with its small red-granite port, the Aragonese tower, the amazing seafront promenade and the wonderful beaches. The Torreruja Hotel Relax Thalasso & Spa is set not far from the little shops and the promenade of the village, in an ideal panoramic and privileged position whence, in complete privacy, you can admire the marvellous red sunsets of Isola Rossa. 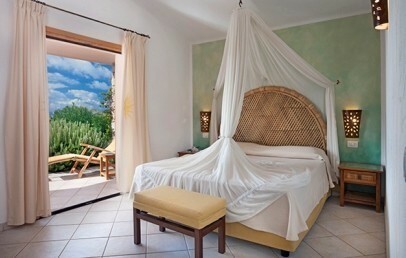 124 rooms furnished in a typical Mediterranean style. All rooms have a veranda equipped with table and chairs, shower, bathrobes for adults, air conditioning, satellite TV, hairdryer, safety-box, minibar, beach towel..
Standard – bedroom with double (or twin beds on request) for 2 adults + 1 infant up to 6 years (cot or sofabed on request). 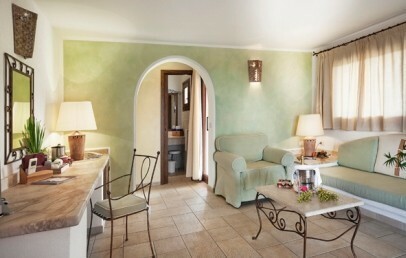 Relax Family – double bedroom + lounge area with inbuilt sofa beds or a connecting second room with twin beds. Suite – bedroom with double bed + lounge with inbuilt sofa beds for a 3rd/4th person up to 14 y. 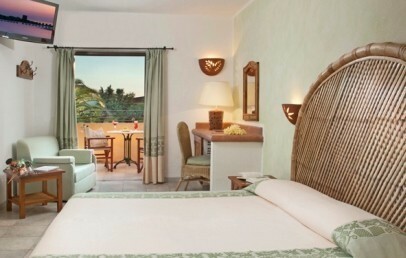 Grand Relax Sea View – double bedroom with a sea view equipped terrace. Possibility to connect this room with a Standard room (upon request). Junior Suite Executive Sea View – open-space Suite with double bedroom, lounge area with sofa bed for two (for children up to 14 y. ); panoramic terrace. Master Suite – elegant Suites with double bedroo +, second room with one or two single beds; separated living room with armchair bed or inbuilt sofa beds; wide panoramic terrace. President Sea View – open space Suite with double bed, lounge area with sofa beds, bathroom. Large equipped terraces with sea view. Imperial Suite Sea View – open space Suite with double bed with bathroom, lounge area with sofa beds + second bedroom with bathroom. Large equipped terraces with sea view. In addition, the hotel has Relax Family Special rooms, that are bigger than the Relax Family and have 2 bathrooms and further the double rooms Standard Special with whirlpool tub and shower. 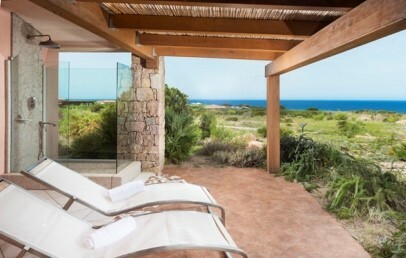 Sardinia is well known for its sunny beaches and its crystal clear water and the Torreruja Hotel Relax Thalasso & Spa, part of the Hotel Chain Delphina Hotels & Resorts, offers several enchanting possibilities. At approx. 200 m from the hotel the fine sandy beach of Isola Rossa, comfortably reachable on foot along the promenade – umbrellas and sun beds are available on hire. At approx. 800 m from the hotel the public beach “Marinedda” offers a wild and unspoilt spot of the island and is reachable on foot along one of the natural paths amid the rocks. The beach service (1 umbrella and 2 sunbeds) has a cost of € 13.00 for one day. Supplement of € 5,00 for the first and second row. Just a few steps from the hotel, many small bays of red rocks between the impressive granite rocks equipped with mats and umbrellas, offer the possibility of snorkelling in an enchanting clear water or just sunbathing in peace and quiet. At last the moment has come to be pampered. The Thalasso & SPA Centre "Venere" offers the possibility of toning your body with the help of a Thalassotherapy circuit in multifunction hydro massage pools filled with heated seawater and several cabins for treatments with sea water, sauna, Turkish bath, relaxing area, elegant massage rooms for massages, refined hydro massage room with fresh water baths, qualified beautician, well equipped gym, water-gym and lounge offering refreshing teas and herb-teas. Access to the wellness centre: € 25,00 per person (half day): free use of the pools, Turkish bath, sauna, gym and relax area. Free entrance for adults staying in President Sea view and Imperial Suite sea view with free use (reservation required) of the thalasso pools, Turkish bath, sauna, fitness cardio room and relax area. PS: A self-certification of "good health" needs to be signed on-site before attending any kind of treatments and to use all facilities. Some kind of treatments are not suitable for pregnant ladies. You may request to our booking assistants further information about all the available packages at "Venere", it will be our pleasure to advice and book for you the best treatment that will complete your wellness holiday package. The wellness center is open 6 days a week, in the afternoon. Breakfast – Buffet breakfast served from 7.30 am to 10.30 am on the panoramic terrace of the restaurant. Dinner – from 7.30 pm to 9.30 pm (low season from 7.30 pm to 9.30 pm), the Tramonto Rosso offers a refined Mediterranean cuisine made with local Sardinian gastronomy served in a large buffet and show cooking. On the terrace of the restaurant Sotto le Stelle, in a romantic setting while admiring the wonderful sunset over the Gulf of Asinara, the refined dishes are served at the table; under reservation with surcharge. Opening is at the management discretion. The buffet service can be replaced with a table service. Lunch – Enjoy the show cooking of the Nord Ovest pool bar: fresh and tasty snacks, cold dishes and pasta recipes and pizzas. Gluten-free meals available on request. Unattended private parking. Reception 24/24. Evening piano bar and random exhibitions of artists by the swimmingpool; live music, bars and pubs with local market available 200 metres from the hotel, in the centre of Isola Rossa village. Free Wi-Fi connection by the reception, pool/bar. PS: payments at the hotel have to be made by a special prepaid card issued in reception; the amount left will be refund when needed. The Relax Family consists of a double bedroom and a living room with 2 inbuilt sofa beds; some of them have a second bedroom with 2 single beds. 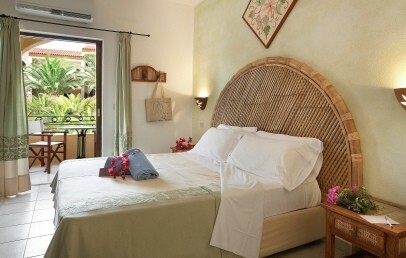 It is furnished in typical Mediterranean style and includes several comforts, bathrobes for adults and beach towels. The private bathroom has a shower and hairdryer. The Relax Family rooms have a garden view veranda with table and chairs. 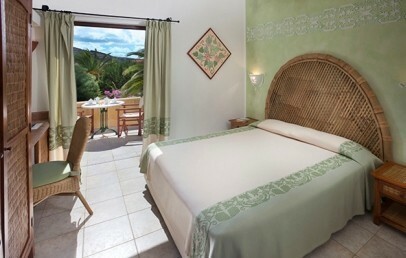 Double room furnished in typical Mediterranean style. Cosy and simple with several comforts included. Bathrobes for adults and beach towels. The bathroom has a shower and hairdryer. 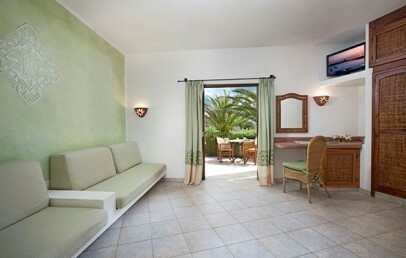 All Standard rooms have a veranda with garden view, table and chairs. The rooms can accommodate additionally a child up to 5 years either in a cot or a sofabed (on request). 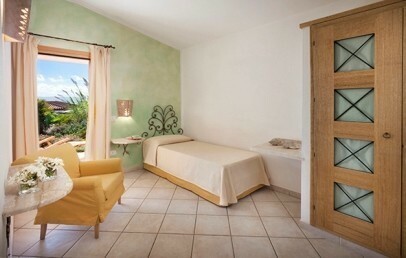 Cosy and simple double bedroom furnished in typical Mediterranean style. It includes several comforts, bathrobes and beach towels. The private bathroom has a shower and hairdryer. All Superior rooms have a garden view veranda with table and chairs. Prestigious Suite consists of a double bedroom and a living room with inbuilt sofa beds. 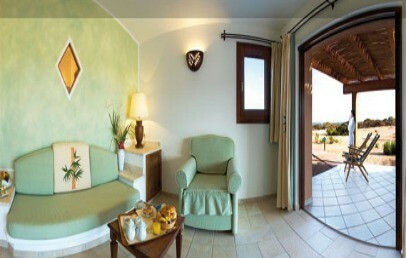 It is furnished in typical Mediterranean style and includes several comforts, bathrobe for adults and beach towels. The private bathroom has a shower and hairdryer. The Suite have a garden view large veranda with table and chairs. Prestigious Suite consists of a double bedroom and a living room with inbuilt sofa beds. 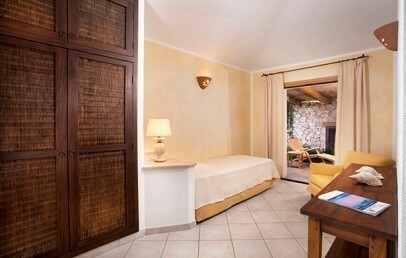 It is furnished in typical Mediterranean style and includes several comforts, bathrobe for adults and beach towels. The private bathroom has a shower and hairdryer. The Suite have a sea view large veranda with table and chairs. 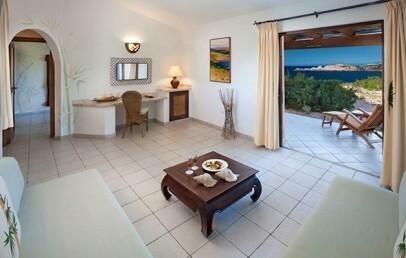 Luxury Suite with master bedroom with en-suite bathroom with shower and an open space lounge area with two sofa beds. The bathroom has a shower, hairdryer, bathrobes for adults, beach towels. The President Suite is furnished in typical Mediterranean style with modern comforts and has a large, panoramic sea view terrace, equipped with table and chairs. Exclusive Suite consists of a double bedroom and a living room with armchair bed or inbuilt sofa beds plus a second bedroom with one or two single beds. 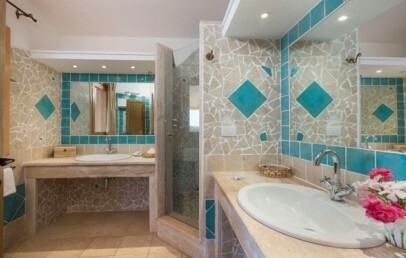 It is furnished in typical Mediterranean style and includes several comforts, bathrobes for adults and beach towels. The private bathroom has a shower and hairdryer. The Master Suite has a sea view large veranda with table and chairs. Exclusive Suite consists of a double bedroom and separated living room with armchair bed or inbuilt sofa beds, plus a second bedroom with one or two single beds. 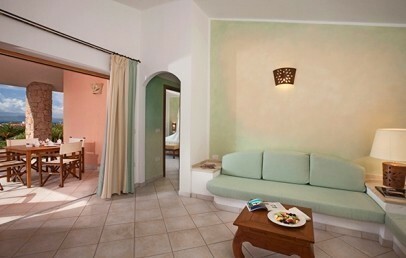 It is furnished in typical Mediterranean style and includes several comforts, bathrobes for adults and beach towels. The private bathroom has a shower and hairdryer. The Master Suite has a garden view large veranda with table and chairs. FREE ENTRY TO THE WELLNESS CENTER: For the adults in the President and Imperial Suite: Free access (bookings necessary) to the Multifunctional seawater Thalasso Swimming Pool, Turkish bath, Sauna, Cardio Fitness and Relaxing area.